When my friend, Hani (Haniela's), asked me to guest post on her blog, I was over the moon! My excitement was followed by a bit of nerves...If you are familiar with Hani, you know that she makes exceptionally beautiful and creative cookies (among other things)! Gulp. Trying to think of just the right cookie, I must have changed my mind at least five times! 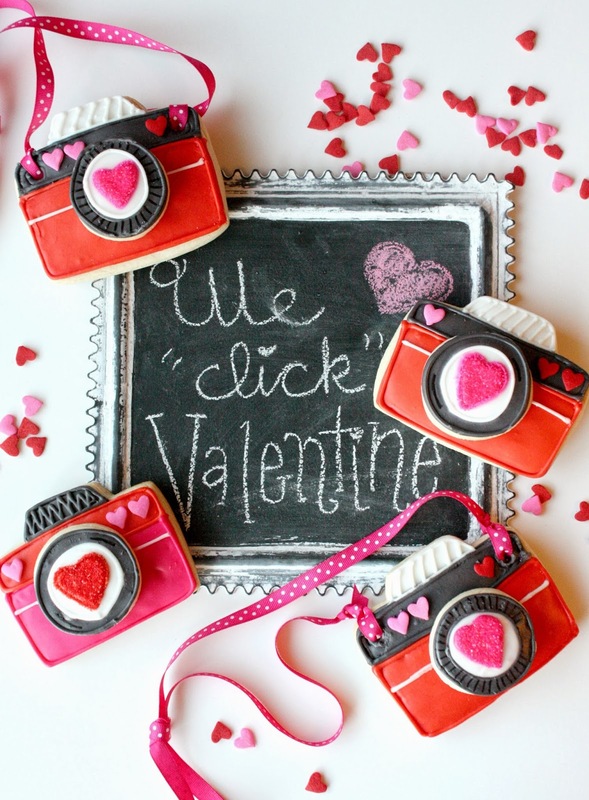 I was in a quandary...until I visited one of my favorite blogs and found some CUTE camera cookies there. Some inspiration was sparked as I remembered that I had some plain camera cookies (along with the round cookie lenses) in the freezer:) I knew I could dress them up for Valentine's Day. Yippee! I was pretty happy with how they turned out. You really can't go wrong with red, pink, hearts and ribbon. I love Valentine's Day! 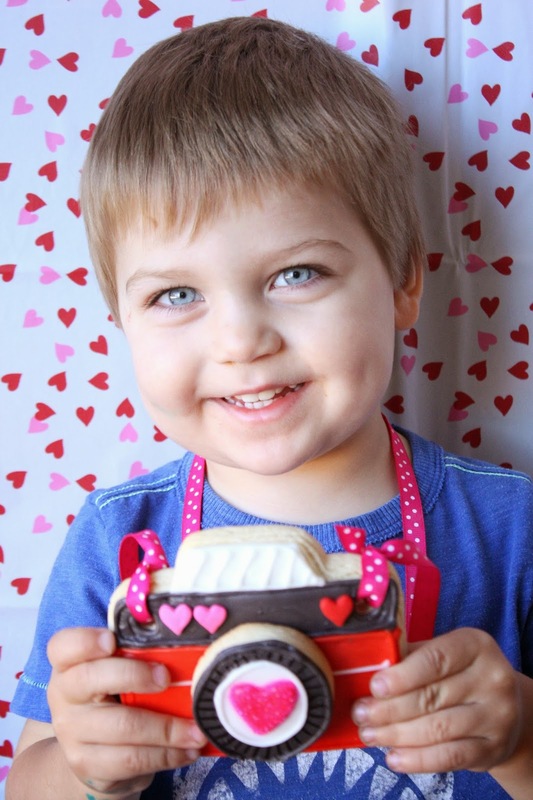 My two-year old grandson was more than happy to pose with his cookie camera and say "Cheeeeese" for my camera. Picture Perfect! 1. Roll out cookie dough. 2. Cut out cameras with a camera cutter and a round cutter for the lens. 5. When the cookies are still warm, use a straw to make a hole for the strap, if the hole has closed. Let cool. 6. Make the royal icing. 7. Divide up the royal icing and tint some with red gel coloring, some with pink and some with a couple drops of black to achieve gray. 8. Using a #3 tip, outline the main body of the cookie, leaving a thick strip at the top for a contrasting color. 9. Fill the main section with the royal icing and let set for about 15 minutes. 10. Outline the next section with a #3 tip and let dry for about 15 minutes. 12. Fill with the royal icing. Let dry for about 15 min. 13. Outline and fill the very top section with white or gray. 14. When all the sections have dried, outline again with the corresponding colors to add dimension. 15. Also add any other icing details at this point. Let dry. 16. Decorate each lens~first the outer ring, with gray royal icing. Let dry. 17. Fill the middle of the lens with white royal icing. 18. Let cookies dry overnight. 19. Use the black edible marker to add lines to the outer lens for details. 20. 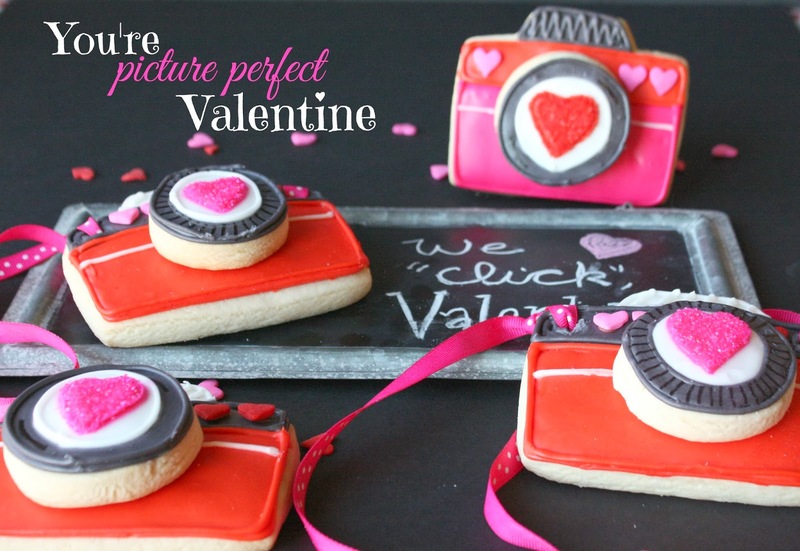 With the pink or red royal icing, and a #2 tip, add a heart to the middle of the lens. 21. Place the cookie on wax paper, and sprinkle liberally with the matching sanding sugar. 22. Let sit for about 15 minutes and then gently dump off excess sanding sugar onto the wax paper. 23. While it dries, add the white line detail across the body of the camera. 24. 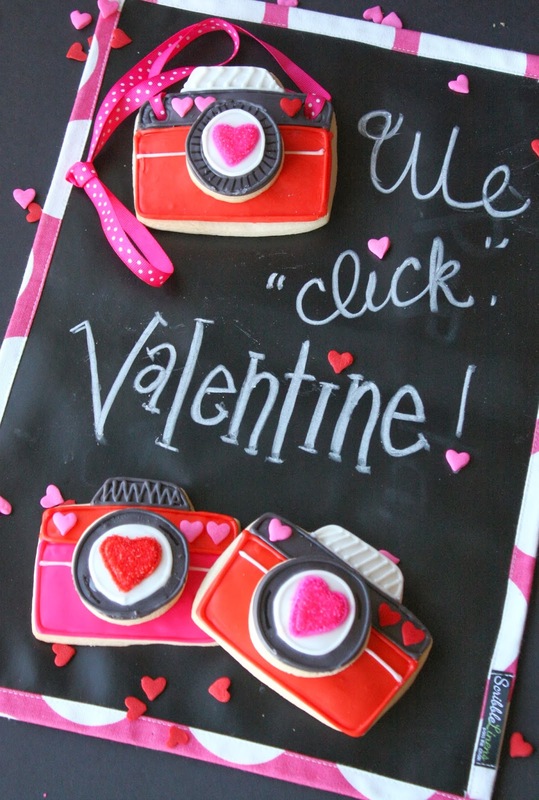 Add the jumbo heart sprinkle details to the camera with a small dab of royal icing. 25. Place royal icing on the back of the lens and gently place it on top of the camera. 26. Let it adhere to the camera until it is stable. 27. Thread ribbon through the camera holes and tie a small knot at each hole firmly, but gently. HOOOOOOOOOOOOOOW CUTEEEEEEEEEEEEEEEEEEEEEEEEEE! Yes, I was squealing! I love these biscuits, I love that little prince!! <3 <3 His eyes are beautiful as the sky and his smile sweet as these creations!! You're amazing my friend. You've got something special in your hands!!!! Very cute idea and I bet my grands would just love these! Oh My Goodness!! Totally adorable! Super cute cookies!!! Your little grandson is adorable!! It's true, the cookies are exceptionally charming; I love the creativity! However, when I arrowed down to the picture of your grandson, I nearly fell off my chair. He's ADORABLE! Oh my goodness, these are so adorable! Thanks so much for sharing! LOVE these Sue. How fun! You are AMAZING! These cookies are really adorable. I'm not sure which is more adorable ... your grandson or the cookie ... think it's a tie! Sooooo cute! Love it all! These are darling Sue! Love the double layer. Pinning! Adorable!! Your grandson is too cute! OK it has to be said, sorry your grandson is even cuter than those camera cookies. But they are super adorable as well. In fact I want a real live camera that looks like that I would totally use it all the time.